Recent price action in US equities has been rather choppy, but is still leaning broadly higher. Further historic highs look viable this month, as the upward wave that began in Jan/Feb', looks set to continue (at least) into spring 2017. The last three months have seen narrow range trading, with an August historic high of 2193, and a September low of 2119. Underlying MACD (blue bar histogram) cycle remains fractionally positive cycle. Upper bollinger is offering the 2210s in the near term, with 2250 by late November/early December. The 2300s will be difficult before year end, not least as the Fed will raise rates at the Dec'14th FOMC. 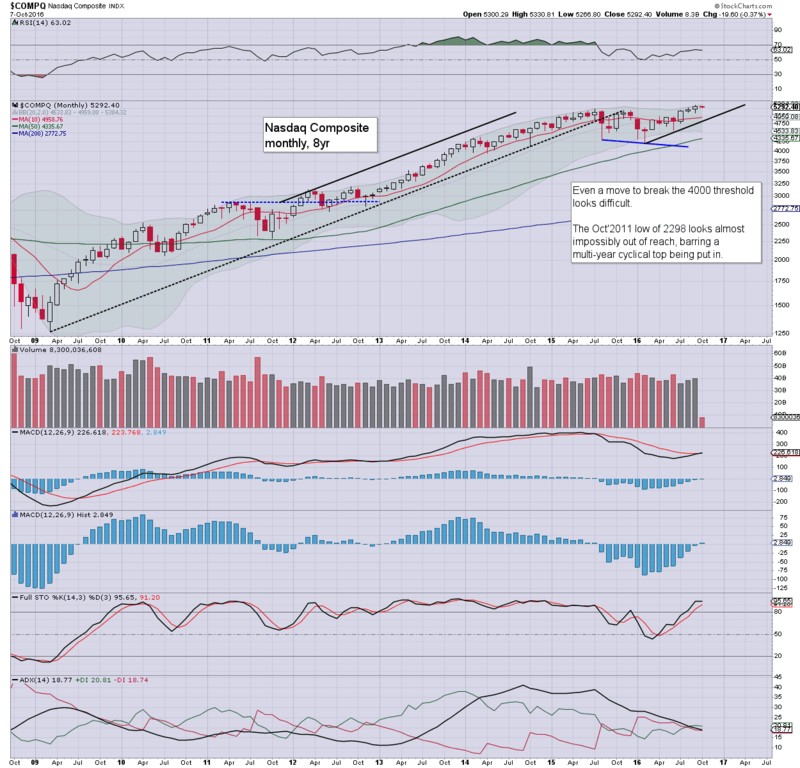 Best guess: near term upside to the 2170/80s, with the 2210s before end Oct'. There will clearly be some 'election inspired' volatility in early November, but once the US populace elect their leader, the market should still be able to battle upward. The monthly 10MA is currently at 2085, and unless we see a monthly close under it, the equity bears have nothing to tout. 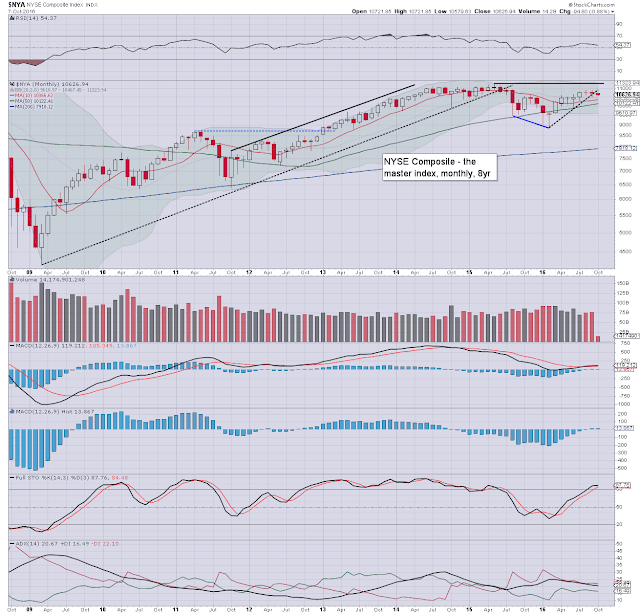 The Nasdaq is leading the broader market higher, having seen a recent new historic high of 5342. Underlying MACD cycle is now positive for the first time since July 2015. Core support is around the 5K threshold. 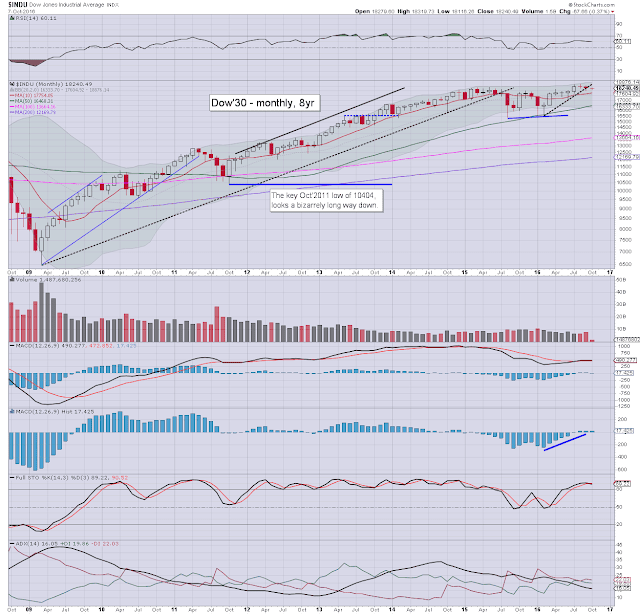 An Oct/Nov' close in the 5400s looks probable, with the 6000s viable by late spring 2017. The mighty Dow remains within a few percent of the August historic high of 18668. 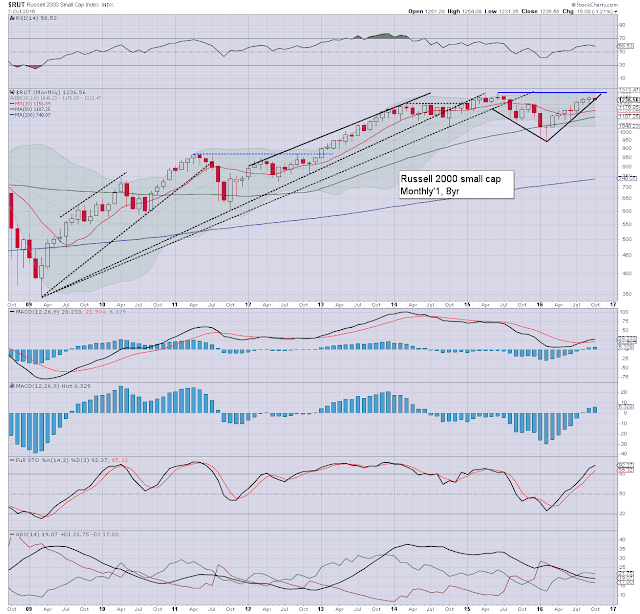 The upper bollinger is offering the 18800s in the near term, with 19K viable in late Nov/early Dec'. 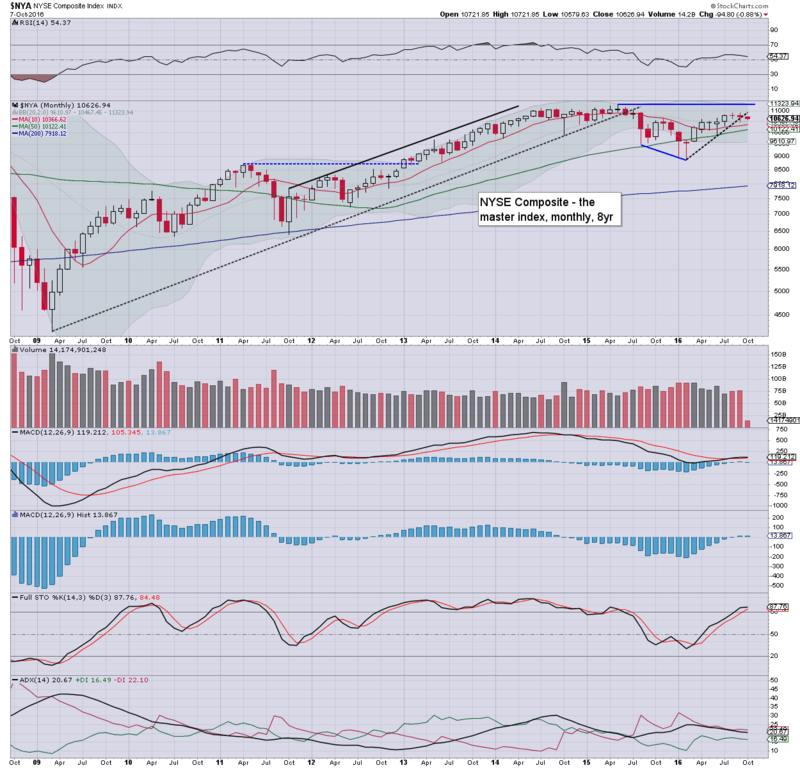 First support is 18k, and then the 10MA in the 17700s. Any price action in the 19000s will give clarity the giant psy' level of 20k will be hit... but that will be far more viable in early 2017. The master index has been stuck in the mid 10000s since July. 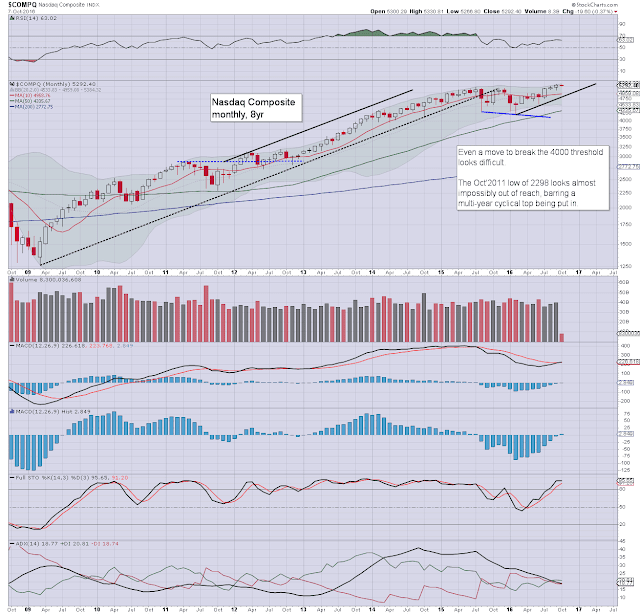 The 11k threshold is well within range before year end. From there, the May 2015 historic high of 11254. 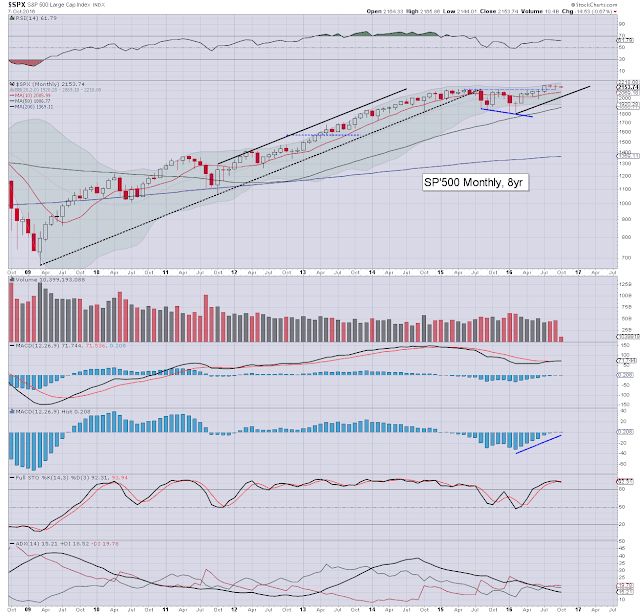 Things only turn bearish with a monthly close in the 10200s. The second market leader - R2K, is testing rising trend from the Feb' low, having climbed 34% - from 943 to a Sept' high of 1263. A challenge of the June 2015 historic high of 1296 looks due no later than end Nov', with a probable year end close in the 1300s. 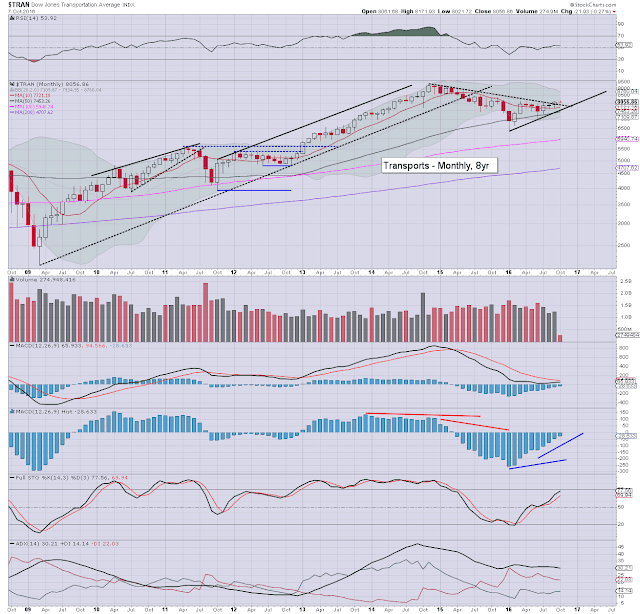 The 'old leader' - Transports, achieved a very notable Sept' close of 8105. Next target are the 8300/400s. Underlying MACD cycle is set for a bullish cross in November. 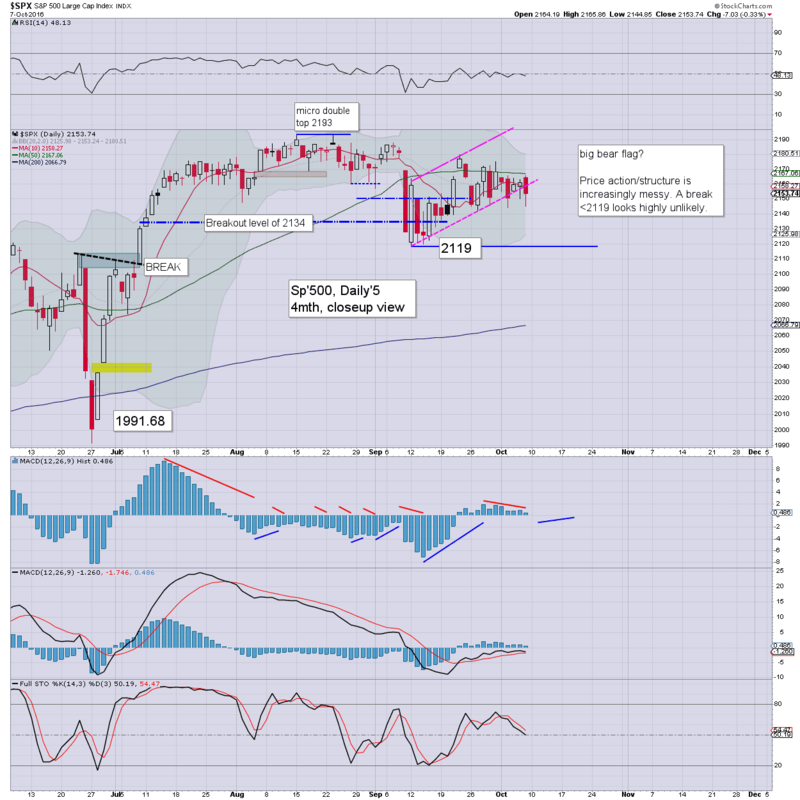 The Nov' 2014 high (9310) is still a long way up, and is out of range until at least Feb/March 2017. US equities have seen a great deal of price chop since July/August. 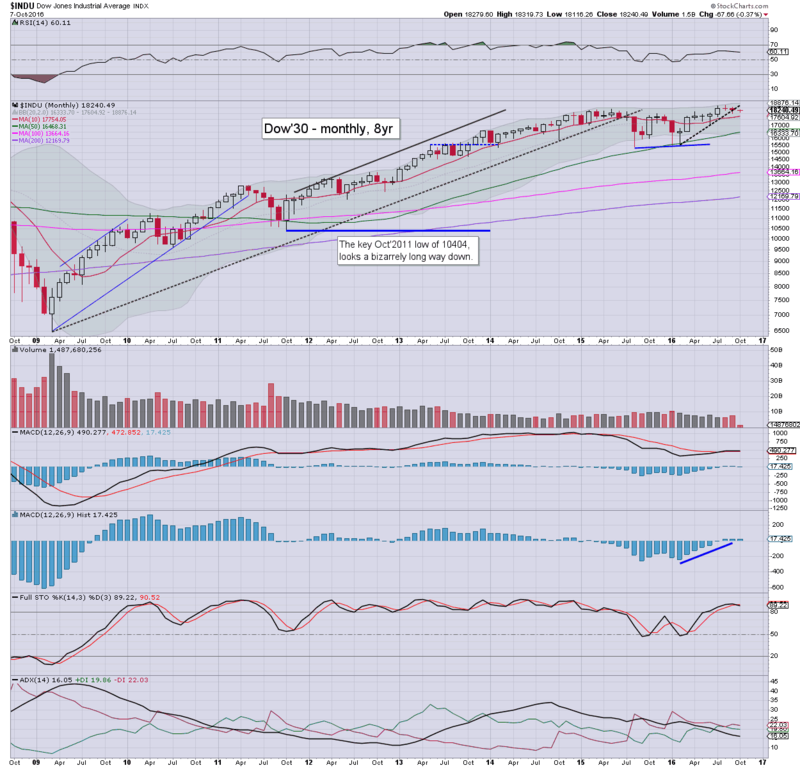 The Nasdaq continues to lead, and along with the sp/dow, could achieve a new historic high before end October. The Transports remains the laggard, but the Sept' close bodes for further broad gains into 2017. The first half of the week is set to be very quiet, not least as Monday is a holiday in the US, although the markets will still open. Friday will see some key econ-data, along with an hour of Yellen. *there is a sprinkling of fed officials across the week. Most notable - Yellen, who is due at the Boston fed, in the Friday lunch hour to discuss 'the elusive recovery'. Now that IS a speech title I can endorse. 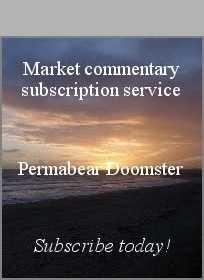 If you value my continued posts here, you can support me via a monthly subscription, which will give you access to my intraday posts at my core home of permabeardoomster.com. US equity indexes closed moderately weak, sp -7pts @ 2153 (intra low 2144). The two leaders - Trans/R2K, settled lower by -0.9% and -0.8% respectively. 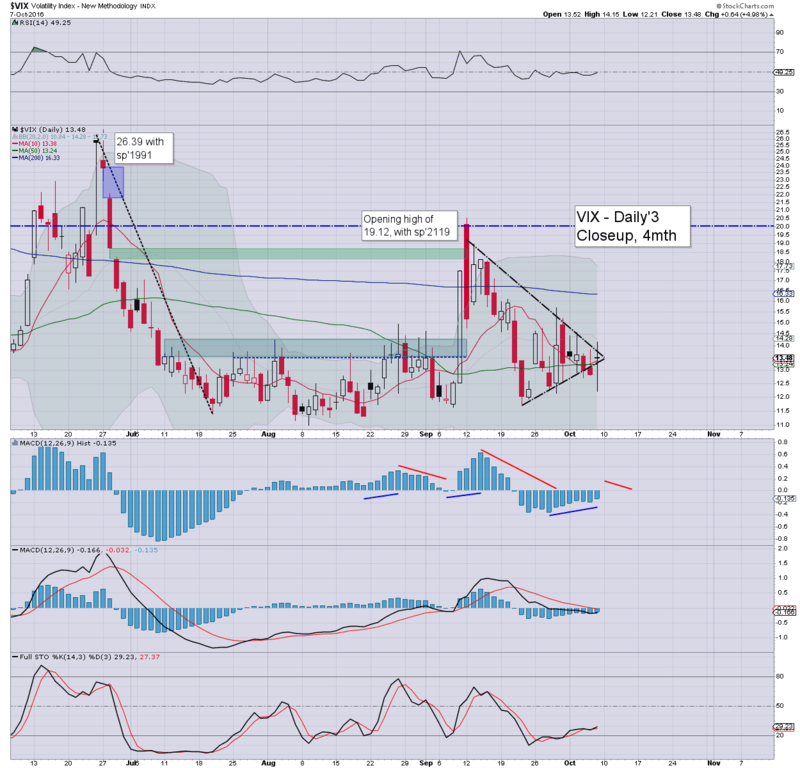 VIX settled +5.0% @ 13.48. Near term outlook offers a push into the 2170s, as Q3 earnings start to pour in. We saw a natural down cycle, flooring at sp'2144. There was a latter day recovery, but it wasn't anything of significance. With indexes closing a little weak, the VIX managed a moderate net daily gain in the mid 13s... which is clearly still bizarrely low, considering the uncertainty of looming earnings and an election. The monthly jobs data wasn't great at 156k, and was well below my target of >200k. Yet... neither was the number remotely dire. It was merely 'reasonable', and that is arguably how much of the dozens of key econ-data points continue to come in. The US economy is not close to a recession... its merely ticking along, which is far better than most other world economies. The Fed's Stanley Fischer touted today's report as pretty close to Goldilocks. Indeed, the Fed don't want too high a number, nor one too weak. This 'ticking along' is set to continue into 2017.. and probably 2018. 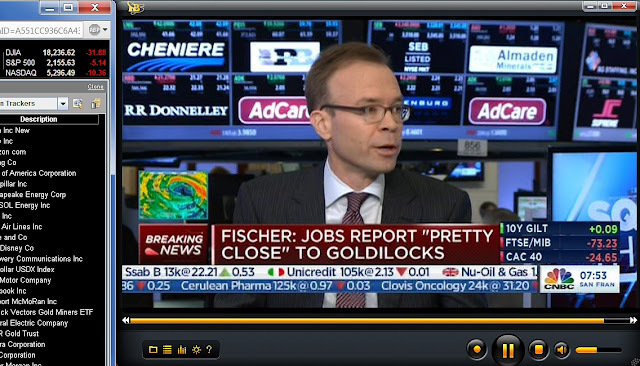 However, the next recession... when it hits, will give us another bear market, probably on the order of 40/50%. Ironically, I do hope we begin such a down wave from much higher... preferably around sp'3K. There will be multi-decade support of the sp'1500s, and that'd be the primary target. 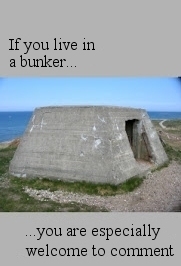 I kinda hope I'm still around to see it happen.